Ph.D. and PAU professor emeritus. 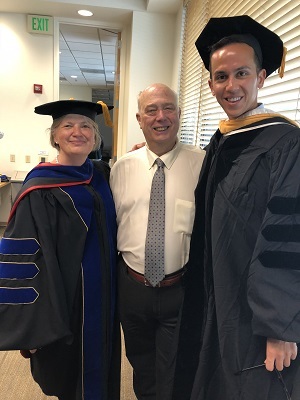 Nicholas Grant, Ph.D., a 2015 graduate of Palo Alto University’s (PAU) Clinical Psychology program, received the 2018 Distinguished Alumni Award at PAU’s June 9 commencement ceremony for his significant career achievements and for making a difference in policies and practices to improve people’s lives. The annual award is given to an alumnus who has made outstanding contributions to their profession and community, and who has committed themselves to advancing the values and goals of PAU for the public good. Grant currently works for the Henry M. Jackson Foundation for the Advancement of Military Medicine as a Research Behavioral Health Assessor, specifically with the Suicide Care, Prevention and Research Initiative. His work focuses on military suicide prevention with an emphasis on developing and empirically evaluating psychosocial interventions and programs for service members and dependents. At PAU, Grant worked with Dr. Peter Goldblum at CLEAR, the Center for LGBTQ Evidence-based Applied Research, and focused his clinical training in health psychology. Grant completed the LGBT Health Policy & Practice Graduate Certificate Program at The George Washington University, an internship focused in behavioral medicine at Tulane University’s School of Medicine, and a postdoctoral fellowship focused in LGBTQ Mental Health at the San Diego VA.
Grant was also selected to serve as the APA William A. Bailey Health and Behavior Congressional Fellow as a part of the APA Fellowship Program, where he served in the Office of U.S. Senator Kirsten Gillibrand (D-NY) and utilized his skills in psychological research to support Senator Gillibrand’s Military Personnel/Veterans, Healthcare, and LGBTQ legislative portfolios. Grant put together a 4-hour “Trans 101” training for the staff, the first known training on this topic to ever be conducted in a U.S. Senate Office. Most recently, Grant spearheaded efforts to bring the APA I Am Psyched! National Tour honoring women of color in psychology to PAU. He remains active in his volunteer service, and serves on the board of directors of the GLMA: Health Professionals Advancing LGBT Equality.